Tour some of the major attractions of Belle Isle in blitz-like fashion on Saturday, September 8, 2018 and end with a picnic style lunch at pavilion 19. This event is sponsored by the Michigan Alliance of Environmental and Outdoor Education (MAEOE). This tour is a fund raiser for MAEOE and includes visits to three sites on the island, plus an optional fourth after lunch - all included in your ticket! Here’s your chance to learn about Belle Isle, its history and finest attractions while supporting the state organization dedicated to environmental literacy in the classroom and connecting students to the nature. 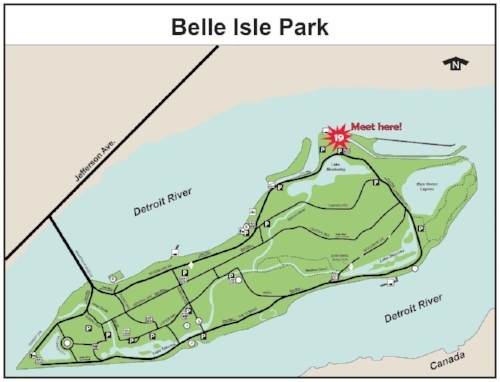 Recreation Passports are required for entry to Belle Isle. Passports can be purchased at the booth upon arrival if they don’t already have one. Questions? Contact Marilena at maeoe.treasurer@gmail.com. This event begins at 9:30am sharp. Meet at Shelter #19 on the far east side of the Island to begin. See the map below with where to meet.